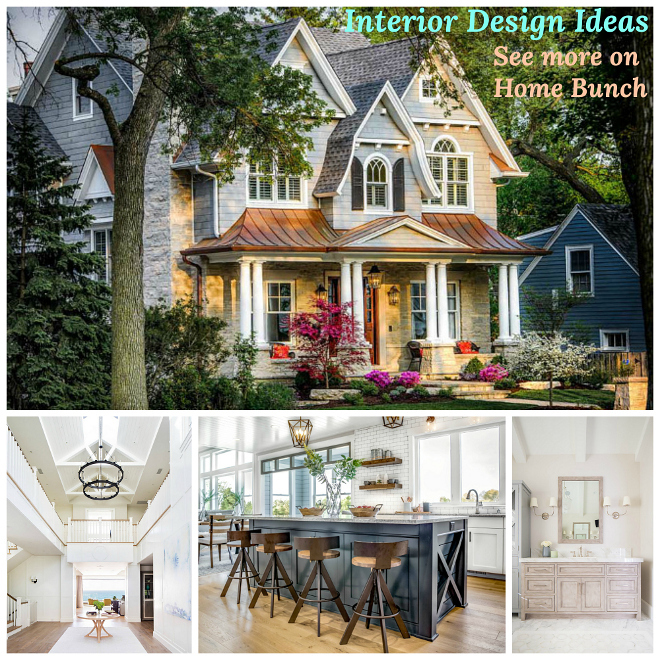 I often say that “Beautiful Homes of Instragram” is one of my favorites posts to share on Home Bunch, and although every single home featured here is special in its own way, this one speaks to my soul. In fact, it did the moment I saw it on Instagram. 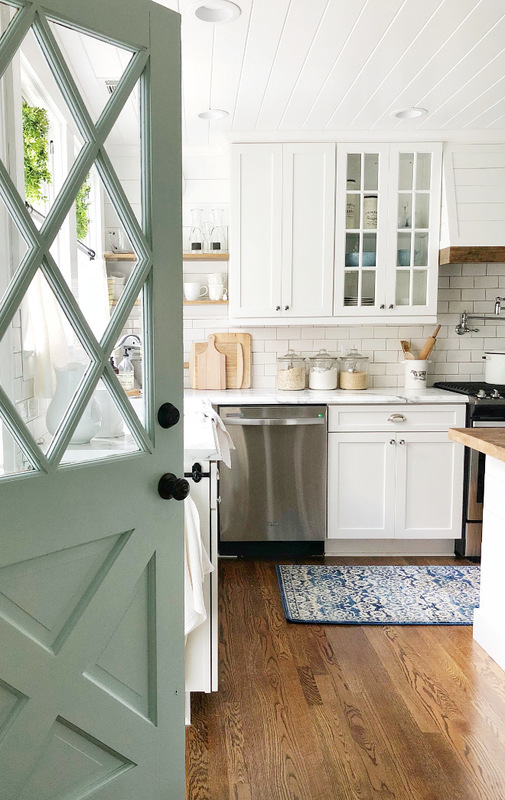 Loren’s home is inspiring and beautiful but it has more to it than just that and I can’t describe it with words but I know that you will feel it with your heart, too. 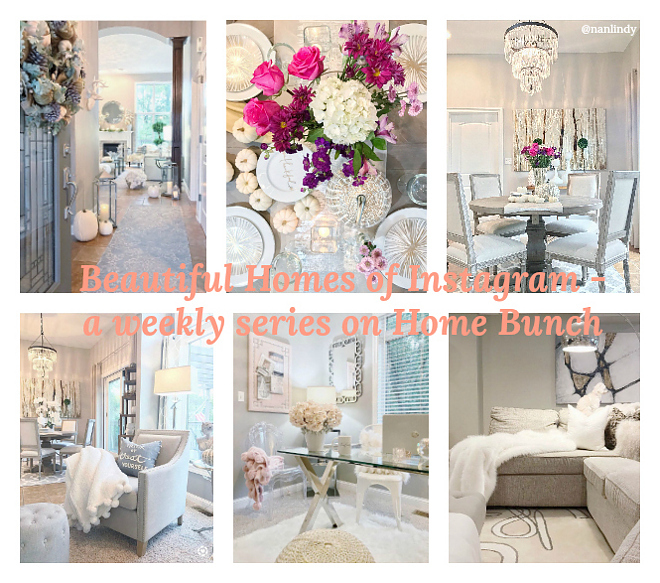 “When Luciane asked if she could feature our home in her “Beautiful Homes of Instagram” series I was in disbelief. After asking if she was sure she wanted to feature our home, her response was so kind and heart-felt and it made me cry. 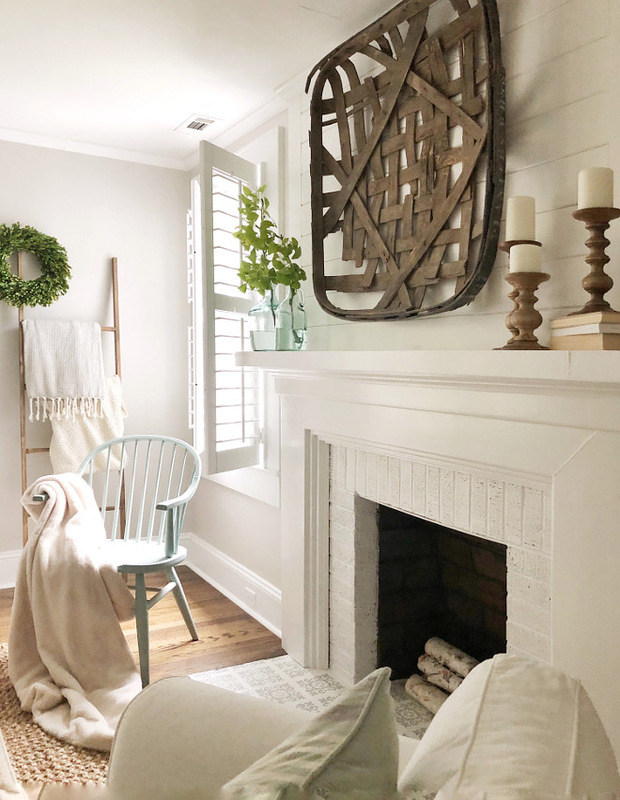 I am both honored and humbled to have our home featured alongside homes I have been pinning for inspiration for years and currently spend time heart-eyeing on Instagram. 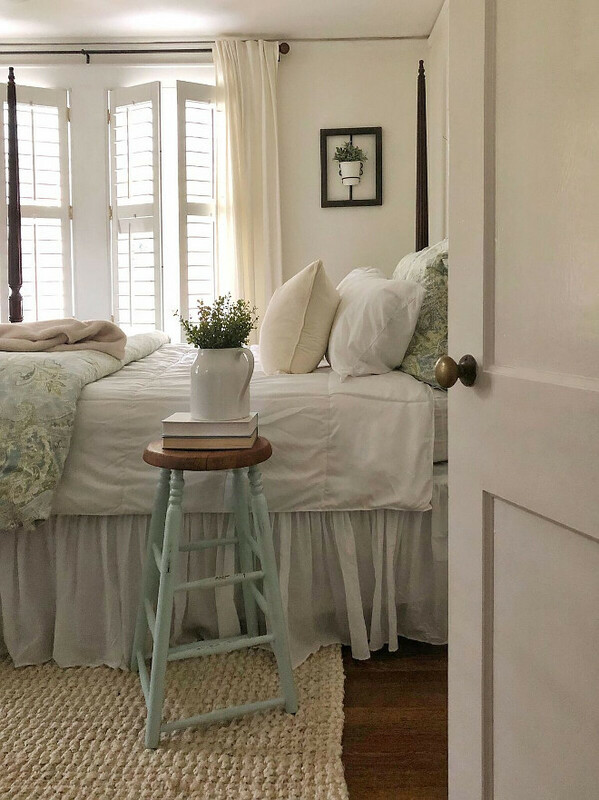 Thank you, Luciane, for the beauty and inspiration you offer to your readers, and thank you so very much for including our home in this series! My name is Loren, and I’ve just recently entered the incredible Instagram Home-Sharing community as @BlueBarnAndCottage. I’m still new to the creative social media world and have so much to learn, but I’m hoping to start a blog one day soon as well. I am a single mama to one sweet girl and a pup. I work full time outside the home for a non-profit, but I dream of one day spending my work days creating pretty homes and working out of our barn. I’ve had a heart for creating “home” since my middle school days. My siblings and I had a playhouse as kids and some of my fondest memories include cleaning it out and decorating it each summer. Decorating back then wasn’t too different from my style today – It included leftover scraps of carpeting from my dad’s jobs, pre-loved laminate countertops and cabinets, and bedding rescued from the donation pile. I distinctly recall one of my most treasured “dump” finds – a black & white mustard colored TV (It still worked!). I have the best memories of revamping that little 100 sq foot home. As I grew older, I’d save baby-sitting money for new bedding or curtains, and I learned the art of pushing furniture around at the age of 12. I couldn’t wait to have my own home back then and creating a home still makes me just as giddy today. I have no formal training in design or construction, but I think it’s just in my blood. My dad, grandfather and great-grandfather were custom home builders and my siblings and I all seem to share their love of homes. New construction isn’t as appealing to me as homes with history though. I have been fascinated by historic homes in need of re-loving for as long as I can remember. There is something so special and almost therapeutic to me about giving a home new life. This is the third home I’ve remodeled, and with each one I gain a little more confidence and take a few more risks. 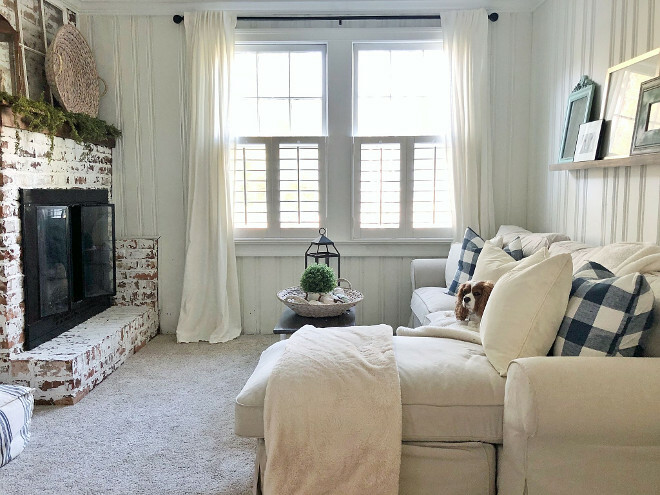 When I bought our last home, I was coming out of a difficult season and the remodel process was a tangible reminder for me that God works through messiness and brokenness and makes it something beautiful in time (even though it looks anything but beautiful during demo and construction). I sold our last home as an investment and purchased our current home just over a year ago. I planned, designed, and sub-contracted out most of the work, completing as much as possible myself. DIY projects always seem to be in the works around here. During initial renovations, there were many days I felt like I was in over my head, but I’m extremely grateful for dear friends and family who helped along the way, I was constantly reminded that God had His hand in it. Remodeling a home is one of the most challenging yet rewarding experiences! People often refer to remodels, with plans to eventually sell, as “flips” but I consider it more “re-loving” a home. I try to keep as much of the original character and charm as possible. 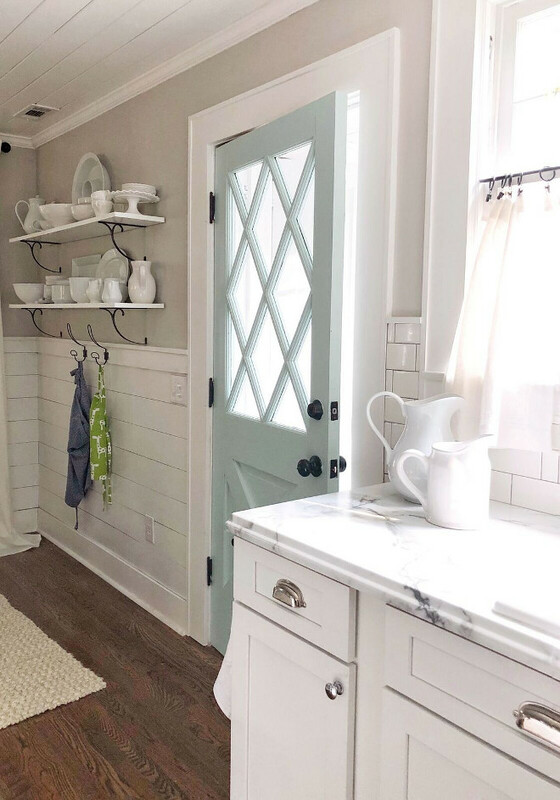 Features like phone nooks, hex tiles, glass door knobs, original hardwood floors, and even sometimes wallpaper, are like found treasure. And one of my favorite things to do is add more character and charm along the way. 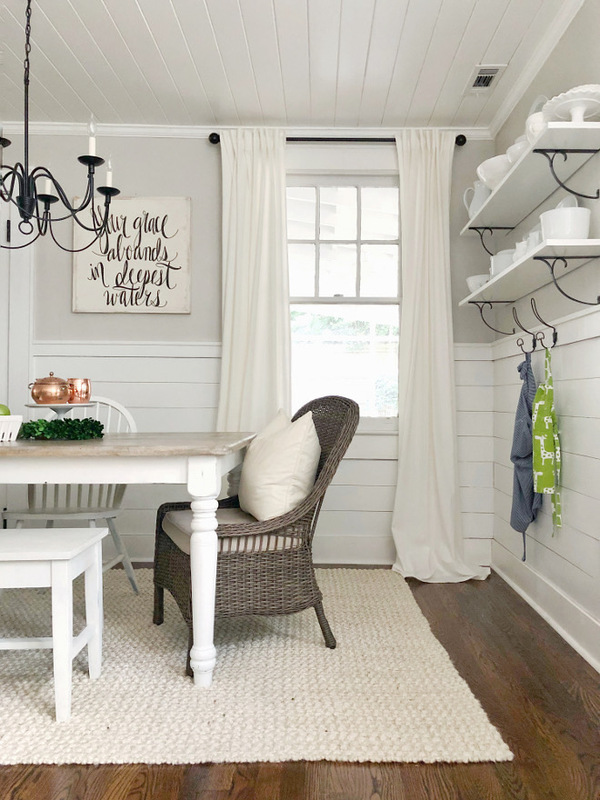 I love whites paired with rich, warm tones, textures like tongue-and-groove ceilings, and wainscotting. I think they bring softness, warmth, and depth to help create the cozy feelings of home. I do my best to find budget-friendly options, including repurposed items and do-it-yourself projects. I’m a bit of a misfit when it comes to my inspiration. I grew up in New Jersey and have lived in South Carolina for 15 years, but New England is where I draw most of my inspiration. I have visited a family home on the coast of Maine for years and a lot of the colors in our home – blues and greens – were inspired by the colors of the seaglass we collect along the coast. 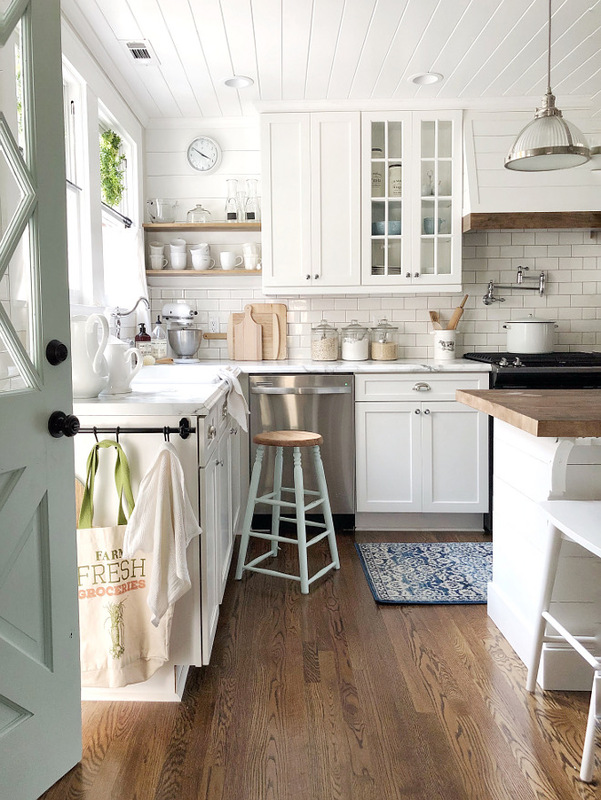 New England style is classic and timeless – It has a lived in, light and airy feel with natural elements, layered neutrals, and painted woodwork. A lot of our furniture, dishes, and even our front door and kitchen door were thrift-store or Craigslist finds. 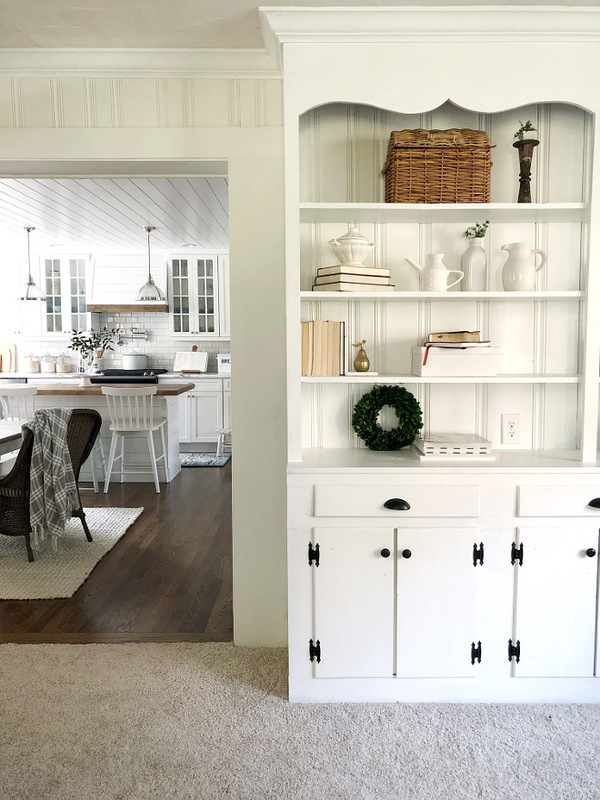 Having a limited budget, I have learned to mix old with new to achieve the charming New England look that I love so much. Most of my furniture and decor items, such as the white pottery collection, came from thrift stores. This has allowed me to create a more collected and cultivated look in our home. 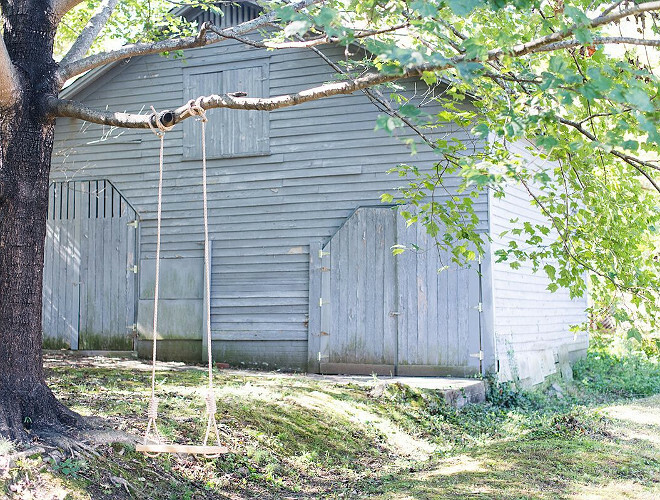 A large part of the reason I was drawn to our current home is because of the century-old barn situated on a hill in our backyard. I have dreamed of owning a barn-store for years. I’m slowly developing a vision for it and hope to start working on it in the coming months. 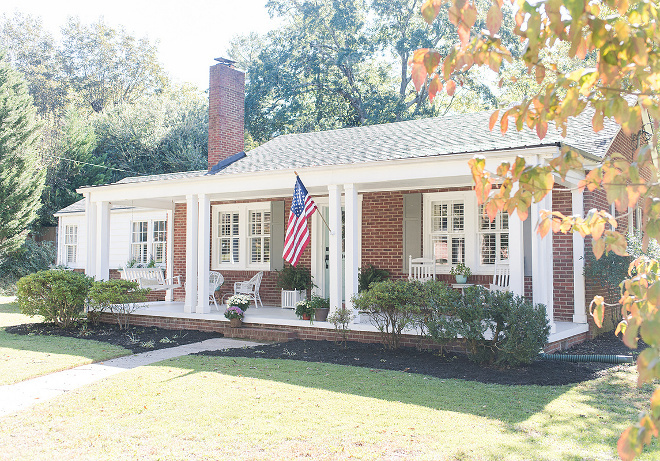 I haven’t made major changes to the exterior of our home, but I removed some of the overgrown shrubs, dark tinted screens, added window boxes, and painted the shutters and porch floor. The floor was a fun project. I decided I wanted it to look like wood planks so a friend and I taped it off with ⅛” painter’s tape and spent a few days completing it. I couldn’t be happier with it. I also replaced our front door. Be still my heart!!! 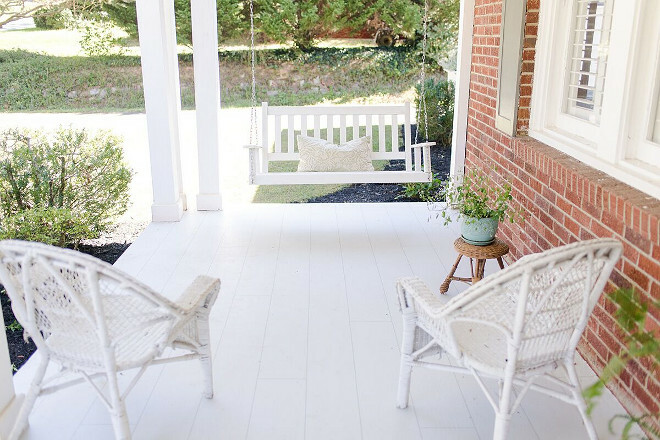 If it wasn’t enough having a swing – it also comes with rocking chairs! Dreamy, right? Outdoor Furniture: All furniture, including swing, were second-hand (Craigslist or thrift stores). I found our front door during a very stressful time in the remodel. I was feeling overwhelmed and very stressed about the budget. I had taken a screenshot of an identical door days before I found it for $10 at a thrift store. I truly feel it was a gift from God to remind me that He would provide. It needed lots of love but it’s still one of my favorite things about our home and a daily reminder that God provides. Front Door: Thrift store find; Painted Farrow and Ball ‘Dix Blue’. 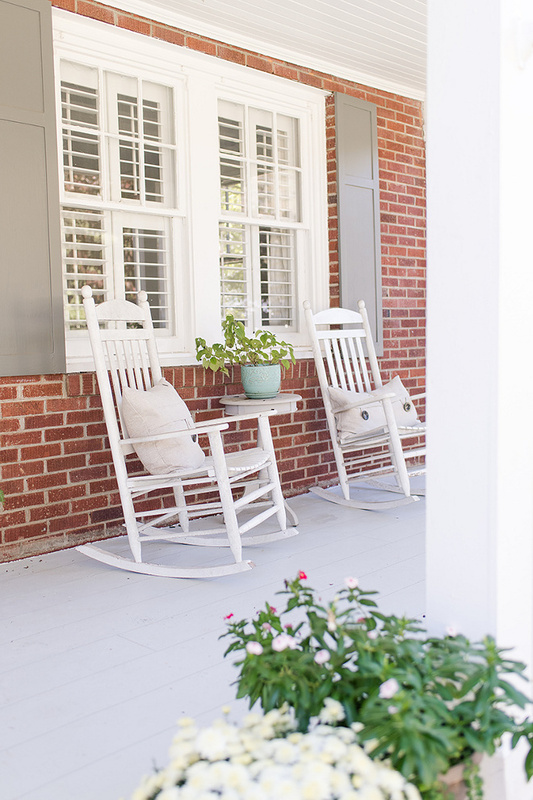 Porch Light Pendant: Joss & Main – Wingate brand Outdoor Hanging Lantern. 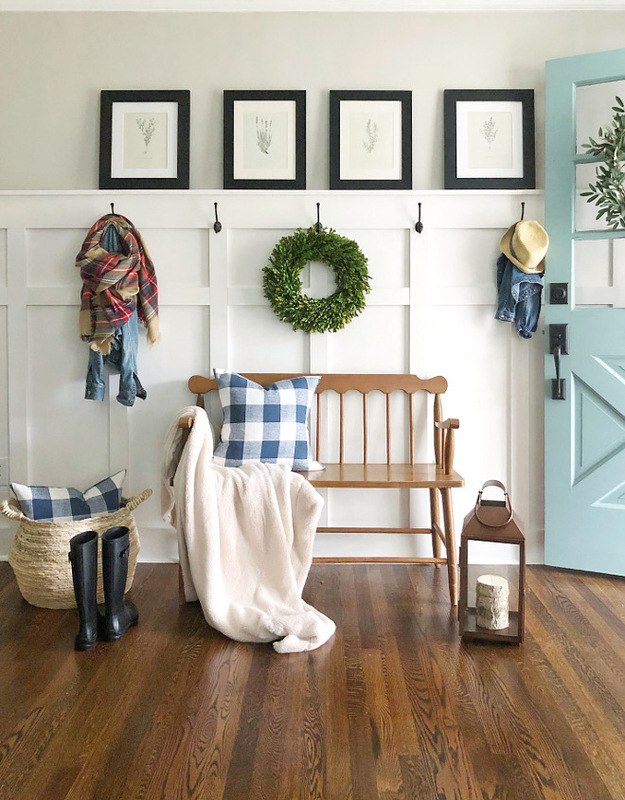 I added board and batten with hooks to the living room and it gives the feel of an entryway without actually having one. The front door opens directly into the living room. 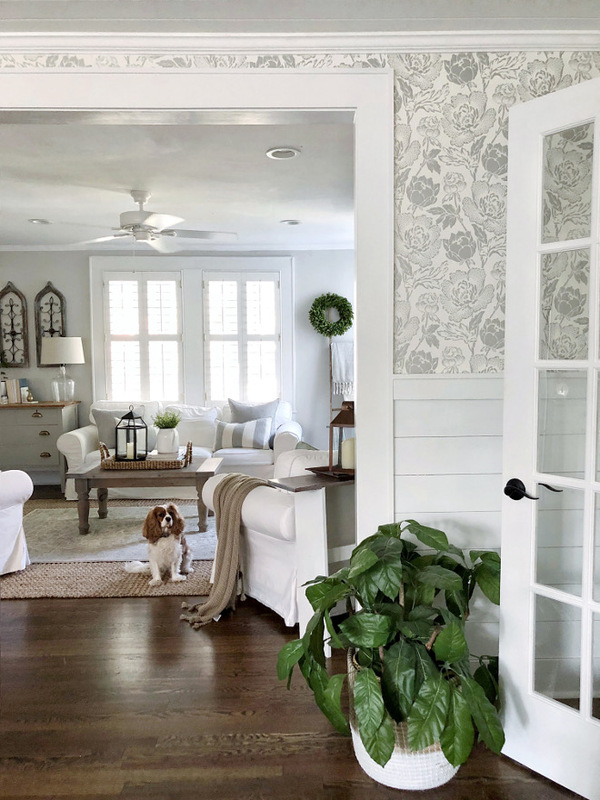 Trim, wainscoting throughout the house: Sherwin Williams Pure White. I opened the wall from the living room to the kitchen, which allows for easy entertaining. There were original hardwood floors under the carpeting and they came out beautifully. I chose to use a dark walnut stain to and depth and warmth since I use so many light tones on the walls and furniture. 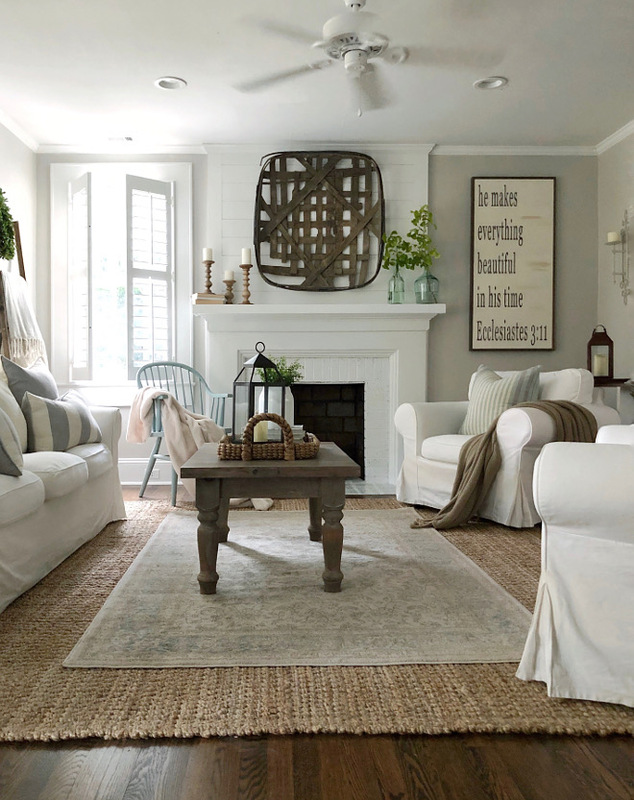 With layered rugs, shades of white, gray and blue/green, the room feels calming and peaceful. I added tongue and groove above the mantel, recessed lighting, and painted the fireplace hearth tiles using a stencil. Paint color is Sherwin Williams Pure White. 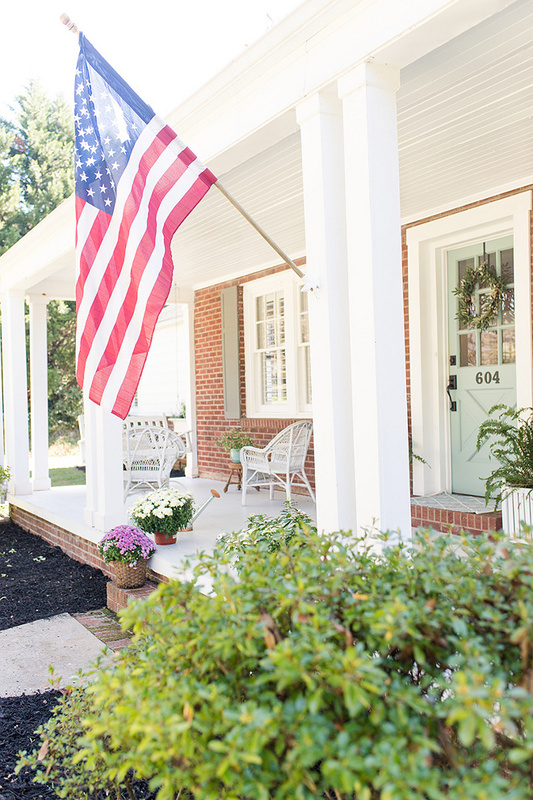 Each detail adds to the overall feel of this welcoming home. Flooring: 2.5 White Oak stained Dark Walnut with satin finish – *Floors were original to the house (under carpet) but added them in the kitchen and had all floors sanded and stained together. 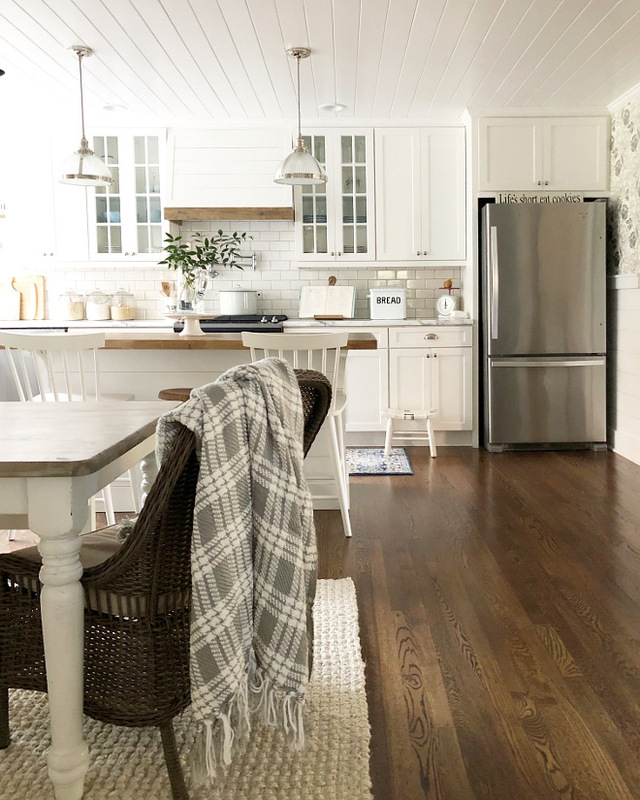 My favorite room in our home is the kitchen and it’s undergone the most drastic changes. 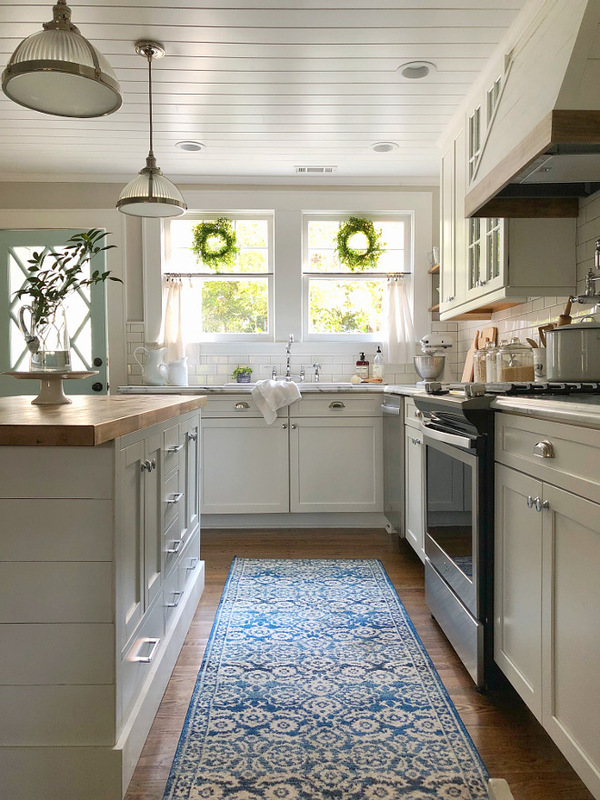 The kitchen was originally a galley-style and was divided into three separate spaces – kitchen, dining room, and breakfast room. From day one, I knew I wanted to remove the dividing walls to make it one large space. I also removed a closet and opened the wall to the living room. I worked within a very tight budget and was able to complete the kitchen space for around $10,000. Our kitchen island is a DIY project using a double-vanity I found on Craigslist. With the help of a friend, we added the shiplap, baseboards, butcherblock top, and corbels. I don’t think anyone would know now that it was originally a bathroom vanity. Island Countertop: Butcher Block stained in Minwax ‘Dark Walnut’. The cabinet paint color is “Sherwin Williams Pure”. 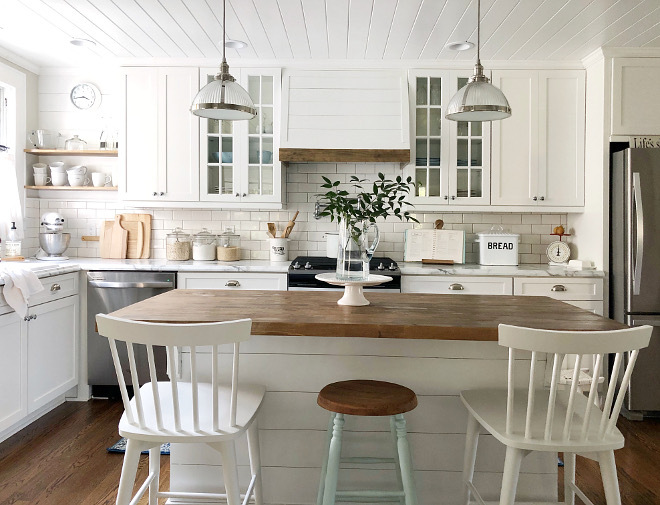 Sherwin Williams Pure White is a fantastic white for kitchen cabinets. Cabinets: Lowes Shenandoah Brand Cabinetry -Pre-painted in Linen. Mission style doors. Ceiling Treatment: Tongue and Groove, painted Sherwin Williams ‘Pure White’. 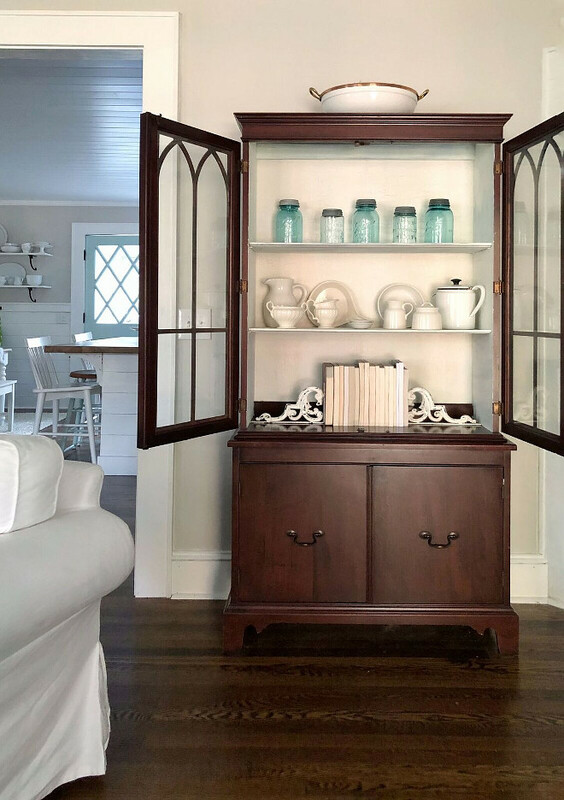 I opted to splurge on a few things like glass doors, a full-depth refrigerator cabinet, full height cabinets, and tongue-and-groove ceilings, but saved by not adding a lot of drawers or extra bells and whistles. I wanted the space to be timeless and open, but also feel warm and inviting. I think the mission was accomplished. I opted for laminate countertops with the look of marble (rather than the real thing). 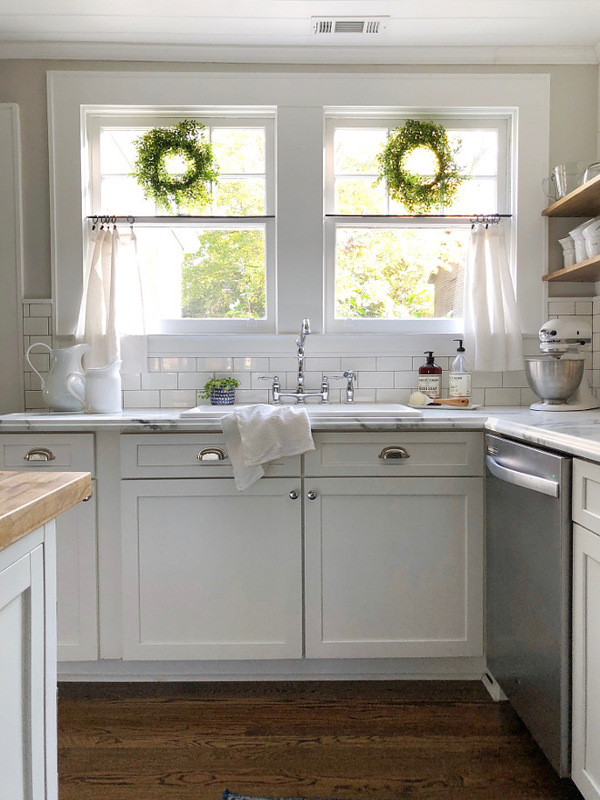 Countertops: Formica Brand 180FX laminate in Carrara Marble with Barcelona edge. Sink: Amazon – Premier Charlestown Two-handle bridge faucet. The hood and open shelves were also DIY projects. I think together they give the space more of a custom-look without the cost. 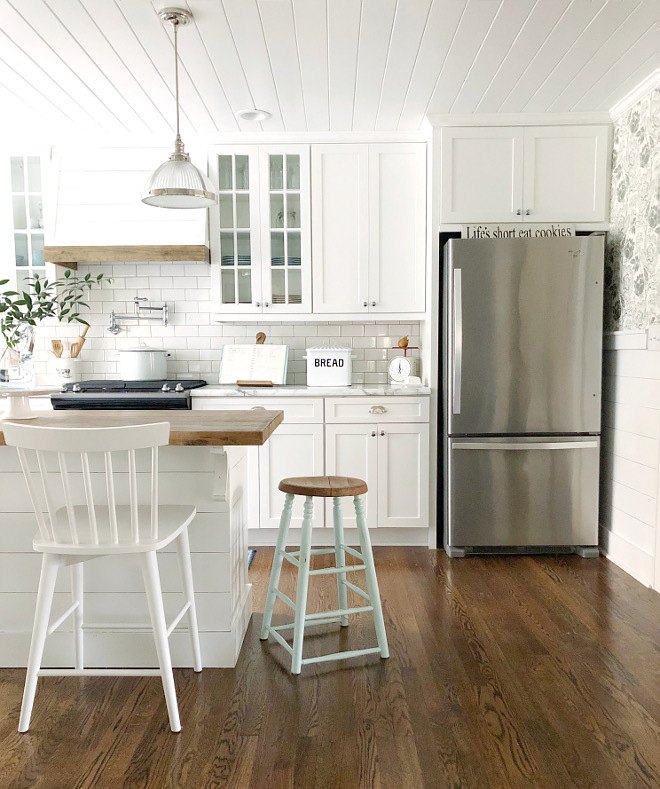 Backsplash: Subway tile – Daltile brand. Walls are Sherwin Williams ‘Agreeable Gray’. Cabinet Hardware: Cup Pulls: Martha Stewart in Polished Nickel. Knobs: Amazon Amerock Polished Chrome. I saw this door propped up on the side of a local thrift store months after we moved in. I knew I wanted a door with a diagonal pattern to break up the vertical lines in our kitchen. I measured the door with a piece of paper that day (it was all I had) and it was a fit! I left a note asking them to please hold it for me because they were closed at the time, and sure enough they did! 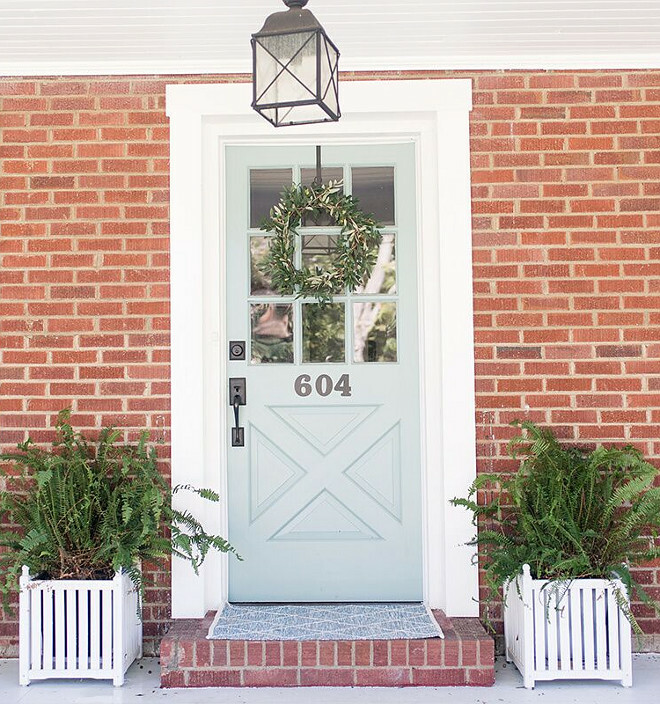 I’m convinced it’s the girlfriend of our front door – It has a more feminine look with the diagonal window panes, but they have matching X-patterns on the bottom. It’s like they were made for this home and each other. 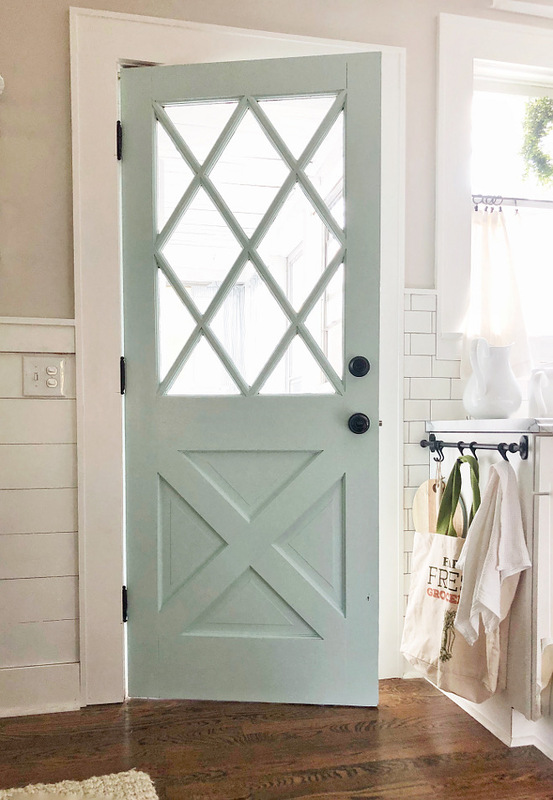 Robin’s Egg Blue Door Paint Color: Behr ‘Whipped Mint’. 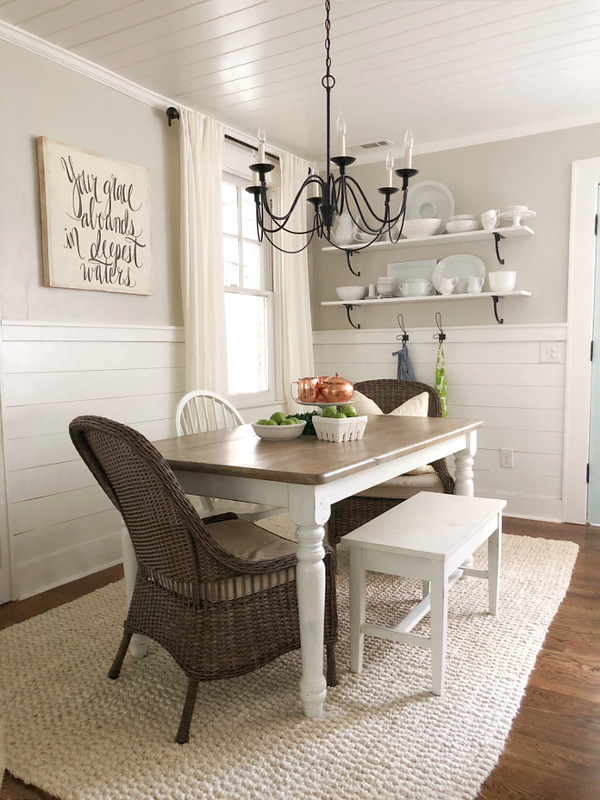 Loren’s dining room features half wall shiplap and neutral decor. Table, white chair and bench: Thrift stores. *I made some adjustments to it though, including removing part of it and spray painting the entire fixture. Our den had very dark wood paneling with blue carpeting when I purchased the home. I painted the paneling Sherwin Williams Alabaster. I recently updated the fireplace with a DIY German Schmear technique. 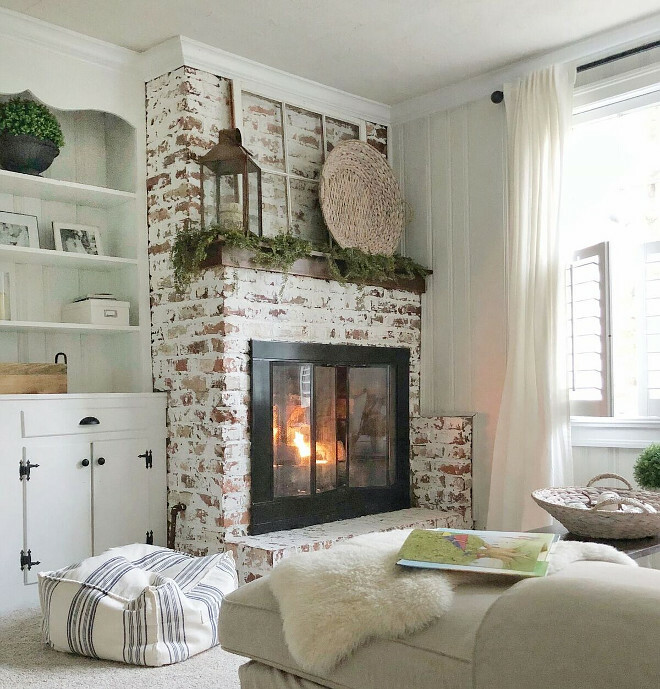 We love the gas logs and carpeting in this room. I also added the french doors between the kitchen and den which is nice when guests stay with us. They’re able to close the doors if needed since the guest room is off the den. I kept our bathroom as original to the home as possible. 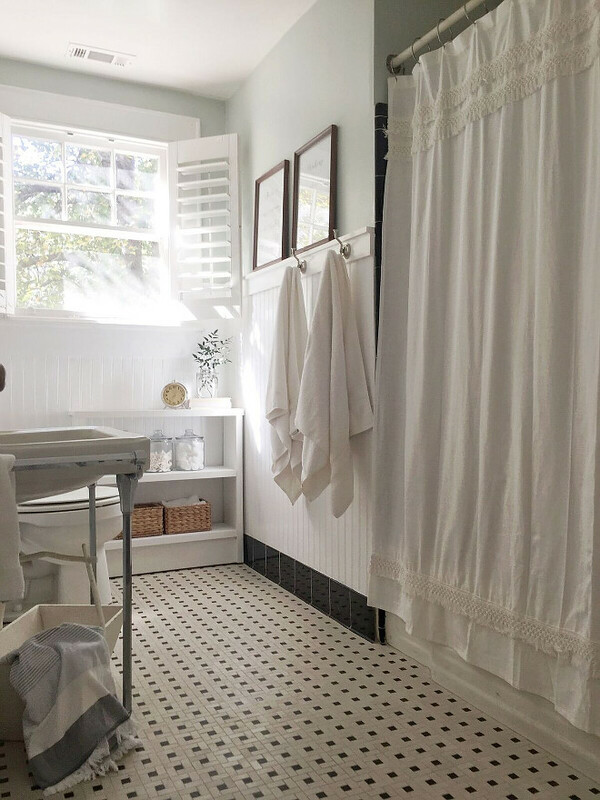 I’m thankful for timeless styles like black and white tiles, because it allows for an updated look without having to spend a lot. 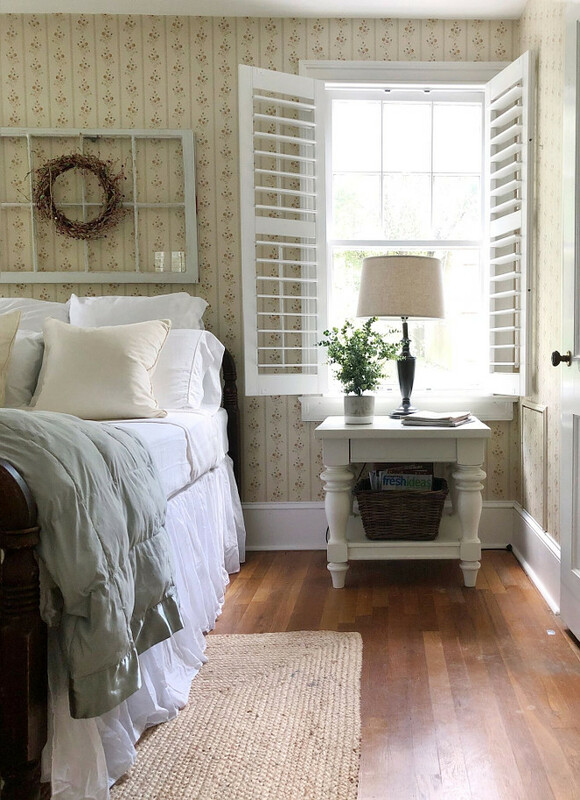 I added the plantation shutters, beadboard, shelves and paint, but everything else is original. I had to get a little creative to cover the holes from the previous radiator – Rather than trying to patch the tile, I added the small bookcase to cover the patching. Bathroom: Original tile, sink, mirror and light fixture. 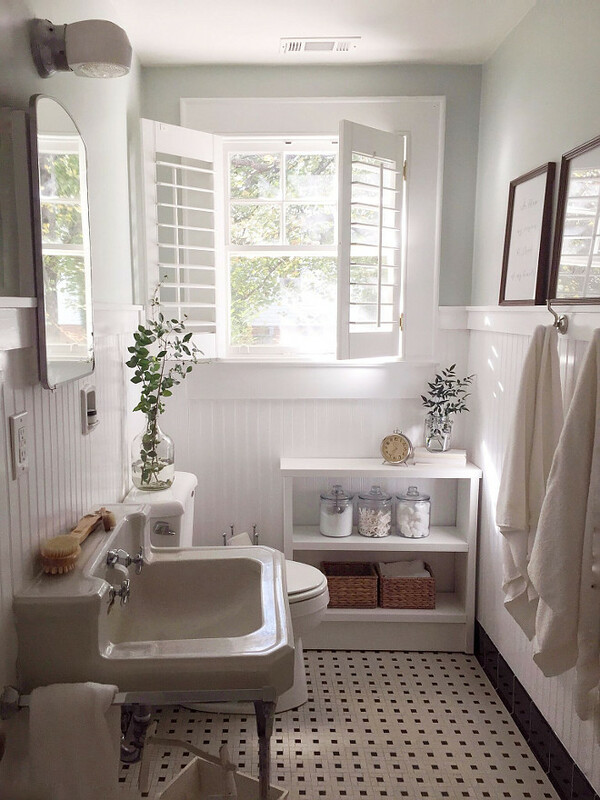 Bathroom: Walls – Sherwin Williams Comfort Gray. 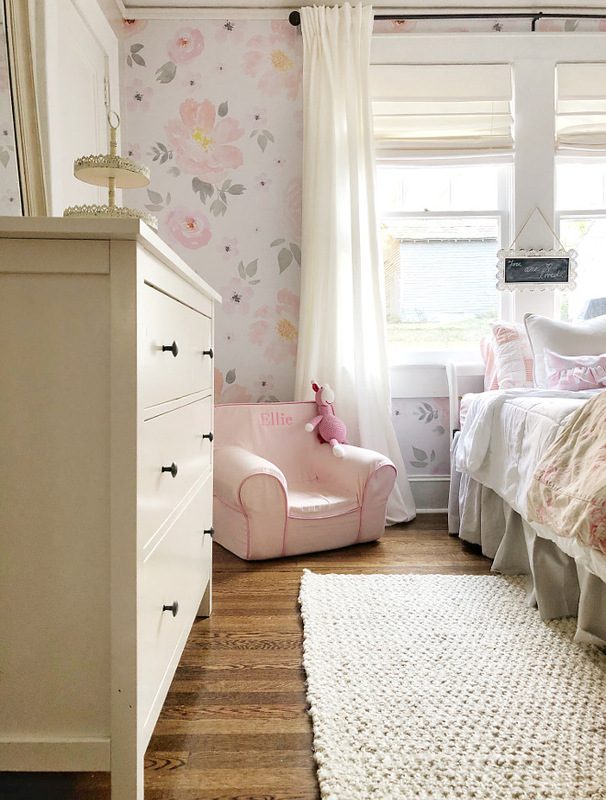 Ellie’s room is one of my favorite rooms in the house. It gets the best (magical) sunlight. 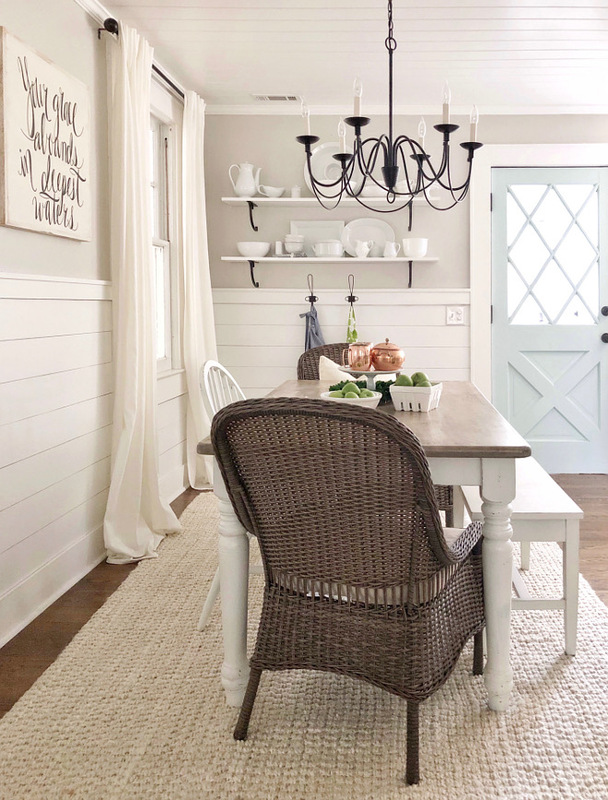 Walls – Benjamin Moore ‘Pale Oak’. I recently added the wallpaper from Wallpaperie in the ‘Amara Floral’ print and photos can’t quite capture it’s loveliness. 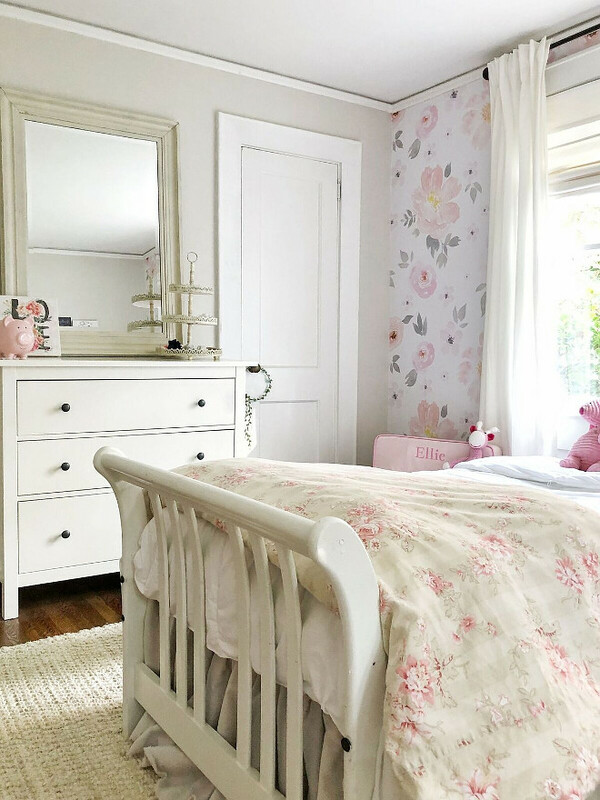 Her bedskirt and precious pink buffalo check ruffled pillow were sewn by a talented friend, Tracy at Tracey’s Feathered Nest. I simply love this bedroom! The wallpaper is original to the house. It was love at first sight with the guest room. I love the corner windows and coziness of this space. It previously had blue carpeting but I tore it out and left it as is. 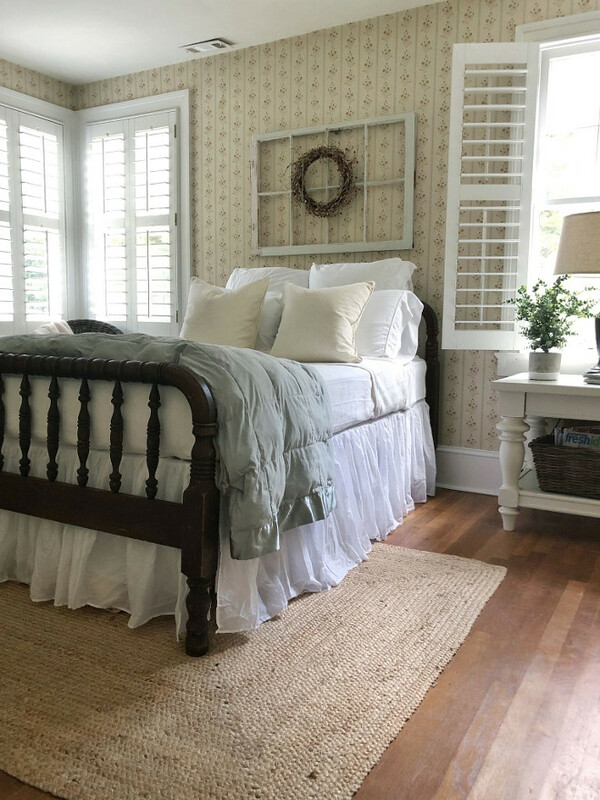 I debated stripping the wallpaper but decided to keep it – It gives this room such a soft, nostalgic feel. There is a small bathroom attached, but I haven’t started this remodel yet. Walls – Sherwin Williams ‘Alabaster’.